Find a vacation home to rent in Castiglion Fiorentino from our list of vacation rental properties. Campaya has over 37 vacation homes available in Castiglion Fiorentino, which give you the possibility to locate a unique accommodation in Castiglion Fiorentino which completes your check-list in search for the perfect self catering vacation apartments in Castiglion Fiorentino or vacation villas in Castiglion Fiorentino. 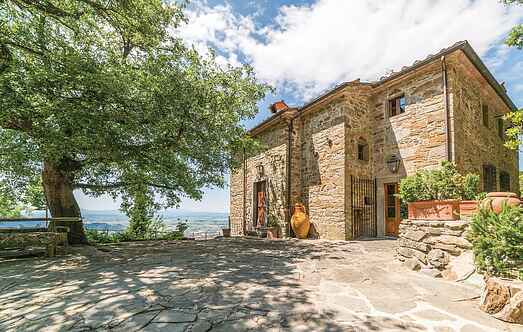 This beautifully restored stone house impresses with its stunning location at 700m altitude. Spacious and comfortable country home in the heart of Italy. This comfortable country house is located in a panoramic opposition amongst the charming hills in southern Tuscany. Located 3 km from Castiglion Fiorentino, friendly holiday home on the hills with private pool. Rustic cottage in the mountains (700m.a.s.l. ), with covered terrace. This beautiful Italian stone farmhouse is located in a prime panoramic position. This former farmhouse on a small hill is about 3 km from Castiglion Fiorentino. This holiday home has two separate apartments that can be rented together. Comfortable stone built house with swimming pool, hillside location with nice view over the valley and Castiglin Fiorentino. Lovely country style décor. Spacious part of a two-family house overlooking the hills and the Tuscan countryside located between Cortona and Castiglion Fiorentino. At about 7 km from Castiglion Fiorentino, on the slopes of the picturesque Valdichio, is this semi-detached house between olive groves and vineyards. Beautiful holiday home with a large garden and a private swimming pool. This property has been renovated to a very good standard and equally decorated with great care and taste. Apartment with terrace set in a wide property comprising a garden and a wood. Swimming pool with children playground shared with ITA628-629. This charming holiday home (semi-detached house) is set in the Chiana Valley between the towns of Castiglion Fiorentino (5 km), Monte San Savino (12 km) and Lucignano (12 km).